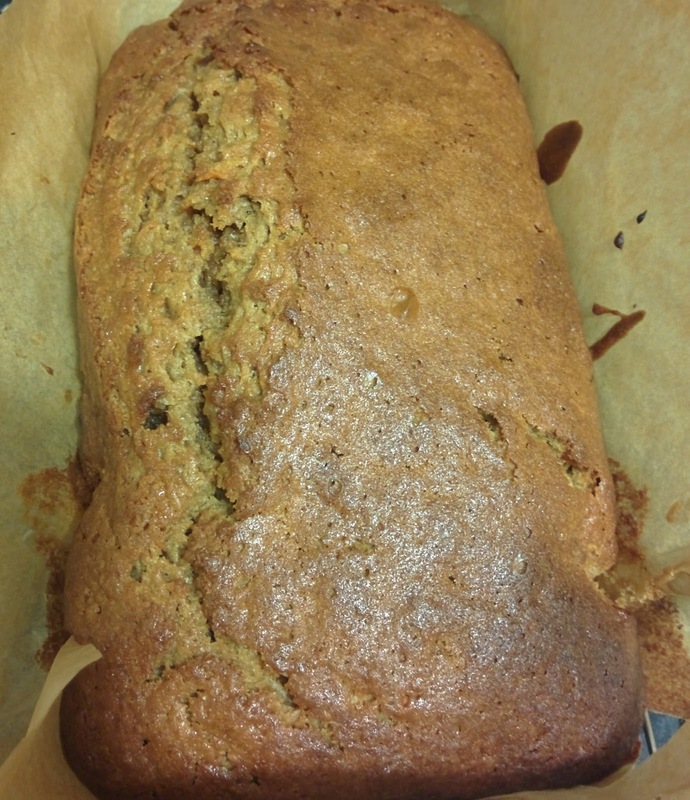 Carrot Loaf Cake – Where Is My Teaspoon? Did you know that Wednesday was National Carrot Cake Day? I swear all these days just come and go without anyone even realising there is such a thing – I only heard of this through Twitter but thought it would make a spontaneous bake for a Wednesday night and for your weekend bake. I wrote and named this post last night and have just discovered that the man who voiced Bugs Bunny has died. I think everyone must have grown up with his voice! For this cake, I used my 2lb loaf tin aka my favourite tin of all time. Preheat your oven to 190 degrees and grate your pealed carrots. If you live in a fancy house with a fully stocked kitchen (unlike me) you can use your food processor to do this. Add the grated carrot to the oil in a small bowl and put to one side. Weigh out all your dry ingredients and mix thoroughly. Add the oil and carrots and beat. Follow this with the teaspoon of vanilla extract. Add the eggs, one by one and make sure to beat well in between each addition. Pour the mixture (it will be thin) into your lined loaf tin and bake in the oven for at least 1 hour and 15 minutes. My oven was fine with this but as always, yours could be hotter so just check the cake after 30 minutes, turn it and keep your eye on it. You can add a tinfoil hat if you like. 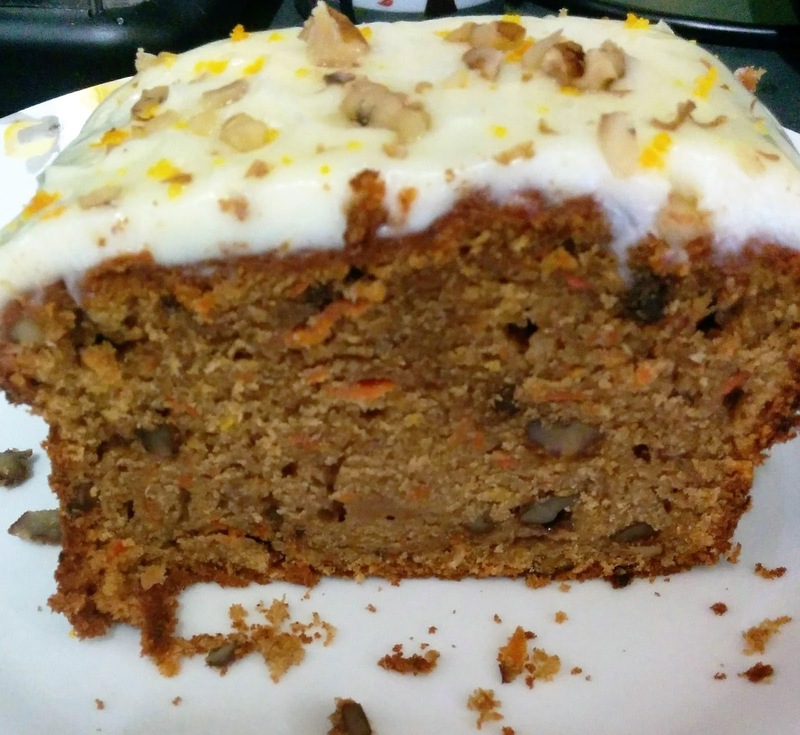 This cake is nice without any topping but as this was for National Carrot Cake Day I thought it would be rude. The icing is simple and once made on Where is my Teaspoon? lots of times before. Simply beat your cream cheese and orange juice lightly. Sieve in the icing sugar and mix well until fully combined. Pop the icing into the fridge until you’re ready to use it. Simply spread all over the top of the cake once it has cooled completely. 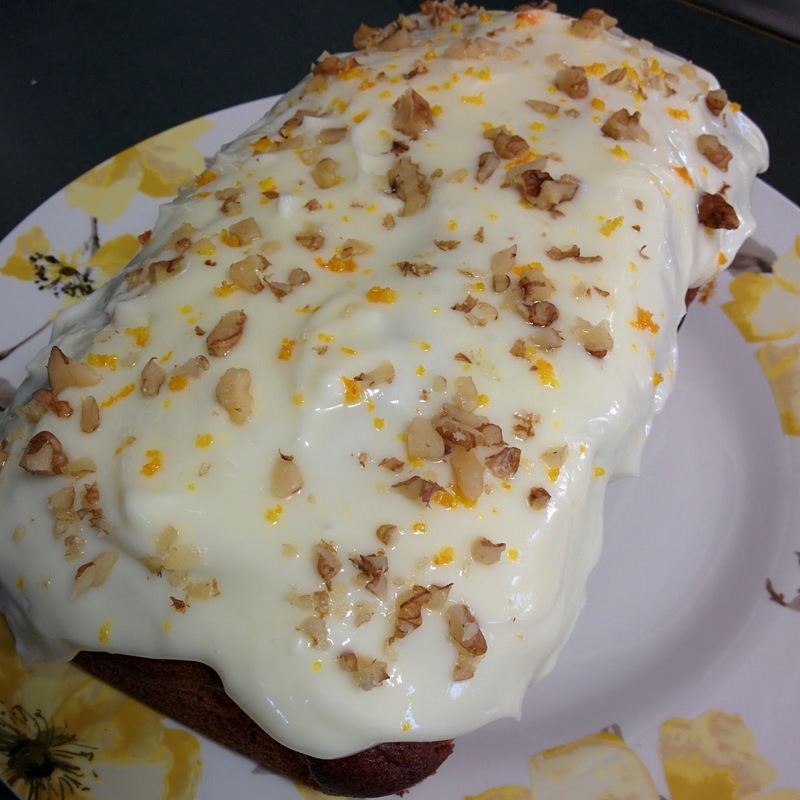 I like to zest more orange on top and sprinkle with walnut pieces to finish. Also, I love the look of messy icing and so let it hang down the sides of the cake. This cake should keep un-iced in a sealed tin for 5ish days. It’s best to keep it in the fridge when iced if it’s going to last more than one day. I listened to Mariah Carey – Always be my baby pretty much non stop while baking this. What a tune! Just wish I had a swing like she has in the video..